Eight-year-old Garang is tending cattle far from his family’s home in southern Sudan when war comes to his village. Frightened but unharmed, he returns to find everything has been destroyed.Soon Garang meets other boys whose villages have been attacked. Before long they become a moving band of thousands, walking hundreds of miles seeking safety — first in Ethiopia and then in Kenya. The boys face numerous hardships and dangers along the way, but their faith and mutual support help keep the hope of finding a new home alive in their hearts. Mary Williams has lived throughout the United States and Africa. She has held positions with several humanitarian organizations, including the International Rescue Committee and UNESCO. In 2000, Williams created the Lost Boys Foundation, dedicated to raising awareness about The Lost Boys and organizing resources to help them. She is the adopted daughter of Jane Fonda and a trustee of The Fonda Family Foundation. Williams lives in Atlanta, Georgia. This is her first book. Essential Qualities – Author’s note at the beginning provides background knowledge and how the book came to be. The afterward at the end gives a glimpse on how the lost boys did once they arrived in America. The map at the end shows the scope of the journey. Organization and Scope – Told in the first person through the eyes of Garang Deng. Has a story feel to it, but still provides information to the reader about the journey of the Lost Boys. Gr 1-5-During the mid-1980s, Sudan was embroiled in civil war in which over two million lives were lost. 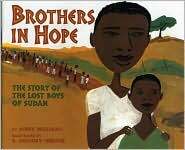 Williams bases this fictional picture book on the harrowing, real-life experiences of a band of approximately 30,000 southern Sudanese boys, between the ages of 8 and 15, who walked nearly 1000 miles searching for a safe refuge. Eight-year-old Garang Deng, one of the leaders, tells his story. Traveling by night, foraging for food, plagued by violence, hunger, illness, and death, the journey is a perilous one. They finally make it to a refugee camp in Ethiopia where they meet an American named Tom who helps them. But fighting comes to Ethiopia, and once again the boys must flee, this time to Kenya. Tom is there to help. He takes down Garang’s story and tells him he will take the story to the U.S. to try to find some help for them. With Tom’s departure, life in the camps is very difficult, yet most boys manage to survive. When the man finally returns, Garang, now 21, asks, “Where have you been, Tom? Did you forget about us?” He explains that he has been spreading the news about the boys’ plight, and now the U.S. is offering them a home. Christie’s distinctive acrylic illustrations, done in broad strokes of predominantly green, yellow, and burnt orange, are arresting in their combination of realism and the abstract, and reflect the harshness yet hopeful nature of the landscape and the situation. An afterword tells what happened once 3800 of the boys resettled in America. This important profile in courage is one that belongs in most collections.-Mary N. Oluonye, Shaker Heights Public Library, OH Copyright 2005 Reed Business Information.